Well another CMBO Fall Festival is in the books and now that we have had time to breathe, sleep, and fully recover from all the excitement, I suppose it’s time to reflect. Overall it was a fun weekend, jam packed with friendly faces and birds. So. Many. Birds. A lot of those birds may have been Yellow-rumped Warblers but what a perfect opportunity it was to learn their soft check call notes as they flit from tree to tree. The weekend started with an amazing kickoff party thanks to our friends at the Rusty Nail and Opticron. Bluegrass band, The Woedoggies, really got the party going, with guest appearance from Migration Count Coordinator Tom Reed and Interpretive Naturalist Jacob Drucker. There was food, drink, laughs, and dancing, lots of dancing. I can’t think of a better way to welcome the participants to Cape May, it was just the event to start the weekend off on the right foot! The birding festivities started bright and early Friday morning, with walks at Higbee Beach, Rea Farm, The Nature Conservancy’s South Cape May Meadows, Cox Hall Creek, and Cape May Point State Park. The rest of the weekend continued in similar fashion, with an incredible variety of walks, boat trips, mini-bus tours, workshops, and lectures—there was no shortage of activities to keep volunteers and participants busy! In the evenings, we were treated to keynote speakers Kevin Karlson, NJ Auduon’s own Dale Rosselet, and the Urban Birder, David Lindo. A total of 188 species were seen or heard between Friday and Sunday, with highlights smattered throughout. 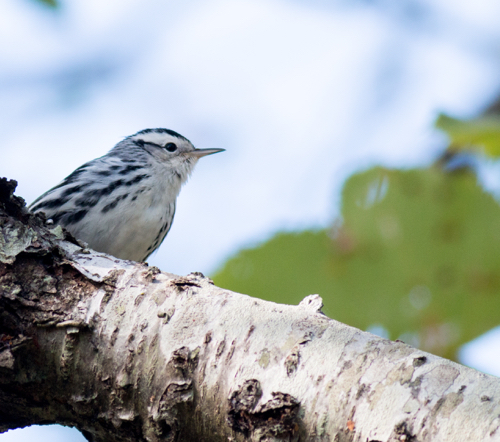 Overall, 17 species of warblers were found, including Prairie, Black-throated Green, and Canada (see, it wasn’t just Butter-butts). The Avalon Seawatch had an amazing flight of Northern Gannets Sunday, with over 4,000 tallied all day and awesome fly-bys throughout the weekend including Pacific Loon, Harlequin Duck, Long-tailed Duck, and Horned Grebes. Dozens of Parasitic Jaegers continued their show of chasing gulls and terns in the rips just offshore. American Bitterns, Virginia Rails, and a Sora were spotted at the Nature Conservancy’s South Cape May Meadows and a late Gull-billed Tern was loafing on the beach down near Cape May Point State Park. New Jersey Youth Birder's Club with leaders Sam Wilson (on left) and Brian Quindlen (on right). It's always great to get binoculars into the hands of young people. They are a fantastic group of birders! The festivities at Convention Hall provided a perfect break from the elements (even though they were fantastic overall). Vendors provided a variety of information on optics and wildlife tours, while artists showed off their beautiful paintings, photographs, and crafts. NJ Audubon’s Nature Center of Cape May provided games and activities for children that included, among other things, a build-your-own-binoculars craft. There really was something for everyone! The birds and vendors were great, but the best part of the weekend for me was getting to meet such a wonderful array of people. From near and far, visitors traveled to share in the excitement and love of birding that can be found in the Cape May community. 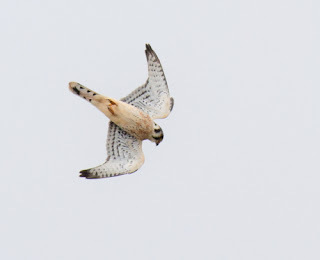 Whether it was studying the various ducks on Bunker Pond or watching the numerous, juvenile Sharp-shinned Hawks zip around Higbee Beach, people were eager to learn and experience the spectacle of fall migration in Cape May. Getting people excited about birds and their conservation is why we at CMBO get out of bed every morning. So on behalf of all of us at CMBO and NJ Audubon, thank you to our participants and volunteers, you are what made the weekend a success! We hope to see you all again next year, but until then, keep birding and help us spread the love we all have for our feathered friends! We are well into October and there’s no doubt that fall is in full swing in Cape May. The leaves are turning colors, the Yellow-rumped Warblers are plentiful, and the sparrows have moved in. Just in the last couple weeks we have witnessed as influx of our favorite, LBJ’s. 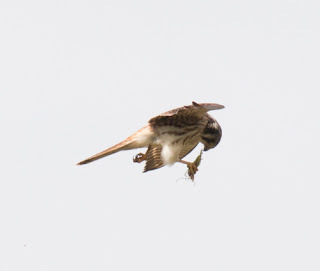 A few Clay-colored Sparrows and Lincoln’s Sparrows have been spotted around Cape Island, as well as a fly-by Lark Sparrow further up the Bayshore. In my own backyard, there is a plethora of White-throated Sparrows and Swamp Sparrows enjoying our new brush pile and recently filled feeders. The soft and sweet chip notes of Savannah Sparrows can be heard around The Nature Conservancy’s South Cape May Meadows as the beautifully streaky birds cross back and forth over the paths. Vesper Sparrows, White-crowned Sparrows, and Field Sparrows have also been seen about town recently. And of course we cannot forget about the understated Song Sparrow, a personal favorite of mine. Even the local flocks of House Sparrows deserve a second look right now for imposters (i.e. Dickcissels) love hiding in plain sight amongst them. If you’re anything like me, just the word ‘sparrow’ starts an increase in blood pressure and a creeping feeling of dread. I begrudgingly began learning my sparrows last fall and I am actually excited to keep up my studies this year. Thanks to a handful of great (and very patient) teachers, I am able to pick out the key characteristics and subtle differences that make sparrow species a unique and fun challenge. These frequently underappreciated birds, with their charming behaviors and intricate plumages, are a welcome part of fall in Cape May. Still not convinced? Well this weekend, the ever-patient Michael O’Brien will be leading a Sparrows workshop for CMBO’s Cape May School of Birding. Details can be found below. It’s a great workshop that will help you break down sparrows into categories and then further to species by observing behavior as well as size, shape, and plumage details. In no time you’ll find yourself going from “Ugh, more LBJ’s” to “Ooo a Savannah Sparrow!” Just in case you need another reason to make the trip to Cape May this weekend, the weather forecast looks extremely promising, with Northwest winds tomorrow through Monday. Fall is here. Come birding. Michael O'Brien's Sparrow Sampler Workshop is this weekend. Contact Chris Tonkinson at (609)861-0700 or by email at chris.tonkinson@njaudubon.org to register. Cape May birding heats up! This morning a big wave of new birds joined many bird already here from before the Nor'easter that battered southern New Jersey into the weekend. The result was a heavy morning flight of birds, both reorienting, and seeking refuge for the day. Don Freiday reported a significant flight of songbirds heading up the Delaware Bay shore from Norbury's Landing, including 18 species of warbler and over 1,800 individuals in a single hour! Our Morning Flight counter Glen Davis tallied just over 2,000 individuals today from the Higbee Dike; not a spectacular flight, but a good one especially following two weeks of northeast winds and little songbird migration (you can check out this season's morning flight data on our real-time site here). Birds are plentiful on the ground today as well, with a noticeable influx of Swamp Sparrows, Blackpoll and Black-and-white Warblers, many Common Yellowthroats, and an overall high diversity of short and long-distance migrants. Oh, and CATBIRDS! Many many Gray Catbirds throughout the forested parts of the island, many feeding on American Pokeberry (Phytolacca americana; good!) and Porcelain Berry (Ampelopsis brevipedunculata; bad! - as it's a noxious invasive species). Many raptors are present overhead today as well, with Sharp-shinned and Cooper's Hawks joined by all three expected falcons: Merlin, American Kestrel and Peregrines. American Kestrel were particularly viewable from Steven's Street, overlooking the Rea Farm fields where they're munching on katydids (to see how the Cape May Hawkwatch is going, visit our real-time site here). But this is just the beginning! If the weather forecast is even half as good as it looks now, we can expect Cape May to be Fall Birding Central all the way into the middle of next week and beyond, right up to our Fall Birding Festival on October 23 - 25 (kickoff party on October 22nd - more info here). Oh the trials and tribulations of a weather forecaster! The past few days have seen us here at Cape May scurrying around to batten down the hatches in preparation for a full-on hurricane assault as Joquin stepped up to a Category 4 off the Bahamas. Birding became increasingly difficult as winds battered the area and had the audacity to remove 20 feet from the top of our big elm tree – the end of a piece of history as the famous branch that held a Crested Caracara two years ago is no more! Extensive flooding of the barrier islands due to ultra-high tides saw our shiny new Avalon Seawatch blind needing to make a tactical withdrawal, but this was allowed for in the clever design which makes the whole unit readily portable. The storm conditions that we have just endured create pluses and minuses for the birdwatcher. Firstly on the downside, small songbirds such as warblers become extremely difficult to find and the exciting spectacle of a fall of colorful birds at Higbee Beach just isn’t going to happen while we have raging onshore winds. On the upside, shorebirds and waterbirds take on a snow globe effect as all the predictable behavior gets shaken up by the weather. The past few days, Don Freiday has done us a great service in travelling around to a number of likely hotspots for ‘shaken up’ birds and texted some interesting counts. As high tides flood traditional roost sites, birds have to move elsewhere and local birders know that, on very high tides, Cape May Airport is the place to go. The wet grass during a storm serves shorebirds well as a temporary roost site and the usual selection of backbay species have recently been joined by Long-billed Dowitchers, White-rumped and Pectoral Sandpipers and American Golden Plovers at this site. Small parties of White-rumped Sandpipers were also passing Sunset Beach on Saturday morning, a site where it is always a special experience to witness Peregrine Falcons harrying storm-blown songbirds and enjoying the stormy winds like it was a walk in the park. But the real downside of Joquin heading so far out to sea is that the hoped-for tropical seabirds remained where they should be and we didn’t get the splendor of enjoying pelagic rarities without leaving the comfort of terra firma. The only exception to this came from the Avalon Seawatch where two Sooty Terns breezed down the shoreline on the late afternoon of October 2nd, to be followed by two more the following morning. Birds like that are always frustrating as you have to be there or you miss them, there’s very little point in hoping to chase them down. Today has started well, with straggling parties of Great Blue Herons, Great and Snowy Egrets and Black-crowned Night Herons descending on the point throughout the morning and ‘classic’ October birds like Golden-crowned Kinglet and Brown Creeper calling from the cedars. Cape May Warbler, Blue-gray Gnatcatcher and the continuing river of Tree Swallows all added to the experience this morning, as well as reports of Hudsoniam Godwit, Seaside and Clay-colored Sparrows, Western Kingbird and Yellow-headed Blackbird. Well, that’s what has been, what about what will be? Predictions are, inevitably it seems, doomed to failure but it doesn’t stop us trying – because we mean well and we want everyone to enjoy the pulse-racing experience that is Cape May at its best. Forecasts show a continued lessening of the winds and a gradual turn to northwesterlies as the influence of Hurricane Joaquin fades. This can surely only mean one thing – birds! There looks like a slight interruption on Friday might interfere with things temporarily but, that apart, the coming week looks like a scarily good conveyor belt of north-westerlies orginiating high up in the Canadian Arctic and, while it is unlikely that we will have wall to wall birding all week, it must surely bring us a wealth of goodies at some point. So our advice to you – come and be here, just in case because, you know, even if it’s not ‘the big one’ there will be birds in Cape May this coming week and the spectacle of migration promises to throw up some memorable moments! Fall is here – come birding!! !